Pro-Line Bash Armor Body Video!!! « Big Squid RC – RC Car and Truck News, Reviews, Videos, and More! Pro-Line Bash Armor Body Video!!! Here ya go Extreme bashers, Pro-Line has posted a video of their new Bash Armor Body! Watch the video below to see the P-L crew push one of their Bash Armor bodies to the max, trying to break it, but coming up short! 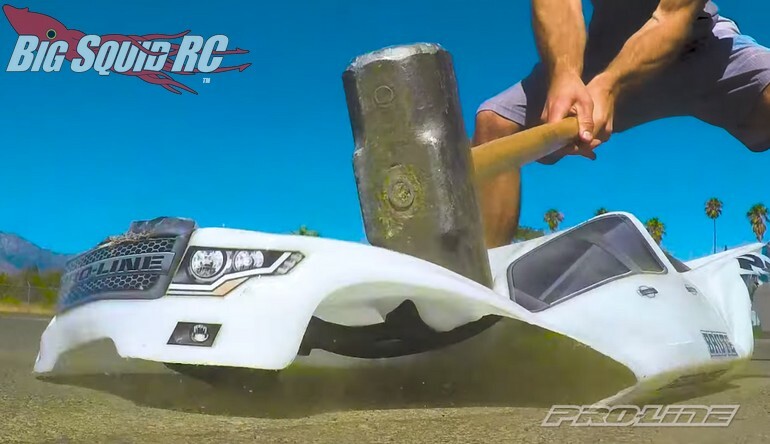 In the video you can watch Vance from Pro-Line go after the Brute Bash Armor body for the X-Maxx with a full-on sledgehammer, then watch them crash it hard to further test the lid. Heck, you can even see them run over the body with a full sized car, just to pop out the damage and continue bashing afterwards! After watching the video, you can hit up This Link for more details on the all new Brute Bash Armor body over on Pro-Line’s official website. Click Right Here to read more Pro-Line news on BigSquidRC.